The first time she passed through Ancona, Julia couldn’t agree more. But, somehow, she kept returning to the city and the friend she made there, staying a few days more every time. Now, both the friend and city are something that she cherishes dearly and can’t imagine leaving behind. 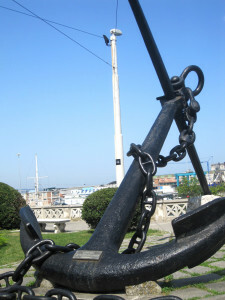 The capital of the Italian Marche region, Ancona is an ancient seaport built on two hills. It has a long history of commerce and naval organization, wedged halfway down the Adriatic coast and boasting transportation routes to Croatia and Greece. With a nearby airport and a fairly large train station, it is true that there is a lot of movement centered around the aspect of the city. Whether you’re flying with a low-cost European airline or you want to take a ferry out of Italy, Ancona is very convenient for passing through. But, if you decide to give it a real glance, you will find just as much history, culture, colors, and tastes as any average Italian city. If not more, thanks to the many immigrants that inhabit areas of the city. There are stores for the shoppers, cafes for the loungers, parks for the children, churches for the historians, and aperitivos that put other food-and-beverage offers to shame. It is true; perhaps the best part of Ancona is its region. A microcosm of Italy, Marche has it all: gently rolling hills, hundreds of vineyards, numberless sunflowers, breathtaking views, local cuisines, cliffs, beaches, national parks, hiking trails, lakes, and a coastline that contrasts sharply with the seemingly endless water. 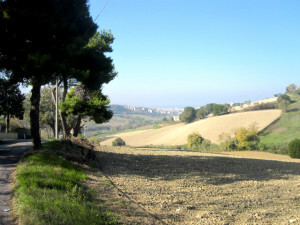 And the immediate region of Ancona is wedged conveniently in the middle of all of this, offering as much of city life as you can expect in this laid-back region with an odd combination of commerce and pure, rugged nature. 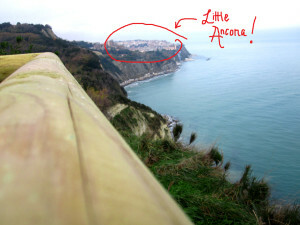 Have a look to our posts about Ancona and it’s surrounding in the Archives section. Ancona is a gem for the daring and adventurous. If you’re willing to look, you shall see!